This set of two guides gives you more than 600 dazzling metallic colour choices – and provides big savings over individual purchases of both guides. 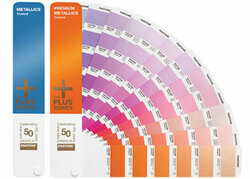 PREMUIM METALLICS is PANTONE’s all new book of 300 sizzling metallic colours developed in response to the rapidly rising popularity of these special-effect inks. PREMIUM METALLICS have a greater brilliance, can be easily coated without any loss in luster and have a longer life after printing without fear of tarnishing or blemishing. PANTONE’s METALLICS Guide features an expansive palette of 301 exquisite metallic colours that add luminescence and elegance to projects that call for a refined look. An additional page demonstrates the effects of a gloss aqueous coating when applied to the seven metallic base colours. 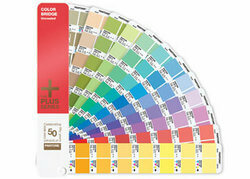 Fan guides are chromatically arranged, for more intuitive color selection. Ink formulations are provided. These guides are printed on coated text-weight paper stock. 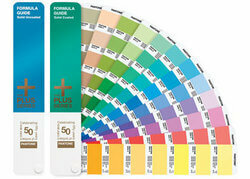 Upon product registration, owners of the METALLIC Guide Set are eligible to receive a free download of PANTONE COLOR MANAGER Software for updating PANTONE Colors in popular design applications.